United Nations: The number of women in executive government and in Parliament worldwide has stagnated, with only marginal improvements since 2015, according to data presented in the Women in Politics 2017 Map launched on Thursday by the Inter-Parliamentary Union (IPU) and UN Women. India was placed at 148 in representation of women in executive government. Phumzile Mlambo-Ngcuka, the head of UN Women, has called for reservations for women across the world. The data showed that women made up 11.8 per cent of the Lok Sabha in India where 64 were elected to the 542-member house and 11 per cent of the Rajya Sabha with 27 of the 245 members. 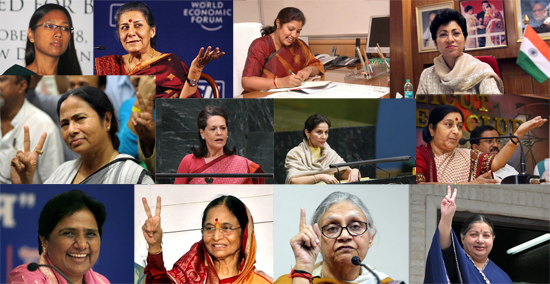 India ranked 88 in the number of women ministers with five or 18.5 per cent in the cabinet. Regionally, women’s representation in the Americas made the most significant gains, according to the report by UN Women. Women’s participation in parliaments rose to 25 per cent from 22.4 per cent in 2015, even as the region saw a drop in Heads of State with the Presidents of Brazil and Argentina leaving office. Female ministers in Africa saw a decline in numbers, after years of steady growth. About 19.7 per cent of the region’s ministerial posts are held by women. In Asia, women hold 11 per cent of ministerial posts, led by Indonesia whose government is comprised of 25.7 per cent women. Among the Arab States, 9.7 per cent of senior executive posts are held by women, led by Tunisia and the United Arab Emirates, at 23.1 per cent and 26.7 per cent, respectively. In Europe, the total percentage stood at 22.5 per cent. A surprise came from the Nordic countries which have traditionally led the global stage in politics, but whose number of female ministers fell by more than six per cent to 43.5 per cent. The report was launched on the sidelines of the 61st Commission on the Status of Women, known as the largest inter-governmental forum on women’s rights and gender equality. The theme this year is on women’s economic empowerment in the changing world of work. A common theme throughout the Commission has been the gender pay gap. Women on average are paid 77 cents for every one dollar earned by a man.